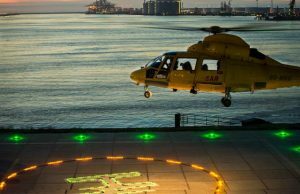 Landing a helicopter on an onshore or offshore facility is still regarded as one of the most hazardous of all flying operations, hence there’s been strong moves to make the task safer – especially for night landing. Orga’s Circle-H LED lighting system has been deemed as the best development, so much so that the UK Civil Aviation Authority has given duty holders (through the internationally-acknowledged guidance for offshore helicopter landing areas – CAP 437, 7th Edition, Amendment 01/) until March 31st, 2018 to retrofit the new lighting system on all UK North Sea offshore platforms. The Circle-H LED lighting system replaces the use of floodlights, which cause glare and the so-called ‘black hole’ effect that leads to loss of pilot vision. This new technology has been proven to radically improve visual cueing for pilots during landing approaches in all weather conditions. Orga developed its touchdown/positioning marking and heliport identification marking (TD/PM) Circle-H LED lighting system in collaboration with the UK Civil Aviation Authority (UKCAA) after almost a decade of trialling to determine the correct modular configuration, colour, intensity, robustness and reliability of the LED lights. Since then they’ve been installed on oil and gas platforms around the world, from the Gulf of Mexico through to the North Sea, Asia Pacific and the Middle East. In addition to Circle-H, Orga has recently released a technologically-advanced illuminated windsock with integrated aviation obstruction light (AOL) option and a new touchscreen digital navaid central control panel (DNCCP) to its helideck LED lighting system. The glove-friendly control panel has cutting-edge multi-touch capacitive touchscreen technology that provides a fast and intuitive interface for users. Critical information can be rapidly viewed, accurately analysed and then immediately actioned from one central location for the safe and efficient control of operations. It’s worth noting that Orga Offshore is a world leader in the development and manufacturing of state-of-the-art hazard warning lights. Products include radar response beacons, foghorns, fog detectors and many other navigational aids, as well as lighting, solar power supply systems and explosion-proof solutions for the aviation, offshore and petrochemical industries. MacLean Electrical supplies this range of products Australia-wide through our Perth, Brisbane and Melbourne offices.